InterContinental Hotels Group (IHG), one of the world’s leading hotel companies, has opened the doors to the highly anticipated Kimpton® De Witt. The unveiling of the hotel in the heart of Amsterdam, marks the first Kimpton® in Europe and outside of the Americas. May 22, 2017 – The hotel has been fully transformed with Kimpton’s bold and playful design. Inspired by Dutch heritage with Kimpton’s signature wit, its spirited edge is immediately evident from the striking ‘living wall’ of vibrant florals and botanicals trailing the entrance. It marries the old and the new – a late 20th century building with architecture from the Dutch Golden Age – interlocking modern luxury and historical elegance. The hotel’s 274 rooms, which include 9 signature suites in the original Golden Age buildings, are inspired by Dutch design, from a modern take on classic Dutch art in the bedrooms to the blue Delft-inspired tiles paving the bathroom floors. Within the property stands a three-storey ‘Little House,’ which dates back to the 1600s and was once the childhood home of the Dutch playwright, P.C. Hooft. Little House can be rented for groups looking for the luxury of a private abode; it offers two king-sized rooms and a first floor living room. Kimpton De Witt’s signature suite, Penthouse De Witt, is split over two storeys and its 30-square metre roof terrace offers spectacular views of the city and the iconic canal house rooftops. Kimpton’s much-loved perks and thoughtful touches can be experienced throughout the hotel. Guests have access to a modern fitness centre, Gaiam yoga mats in every room and a complimentary all-day tea station in the lobby. True to Kimpton form, extra special perks take on a local slant. Guests can pedal away and explore the city on complimentary VanMoof bikes, luxurious in-room toiletries are supplied by Amsterdam-based natural skin care brand, Marie-Stella-Maris, and a hosted social hour every evening gives guests the chance to socialise and enjoy the hotel. Kimpton Hotels & Restaurants is famous for its award-winning restaurants and bars and Kimpton De Witt is no exception. Next to the hotel, Wyers Bar & Restaurant, run by Executive Chef Sam DeMarco aka SammyD, offers American staples with Dutch influences, whilst House Bar provides guests and locals with a luxurious resting post where bartenders craft creative cocktails using unexpected ingredients as well as serve an extensive menu of local gins and genevers. Local passers-by can grab a hot cup of strong coffee, made with coffee beans roasted locally especially for the café and fresh sugar-dusted beignets, at Miss Louisa Coffee & Beignets. The walk-up window is open for early morning, afternoon and evening snacks. The hotel, which is in the heart of Amsterdam’s vibrant city centre and near the city’s Centraal Station, marks a milestone for IHG as it brings the Kimpton brand to Europe for the first time. Angela Brav, IHG’s CEO, Europe, commented: “Europe was the original inspiration behind Bill Kimpton founding the brand and now we’re bringing the brand home again. 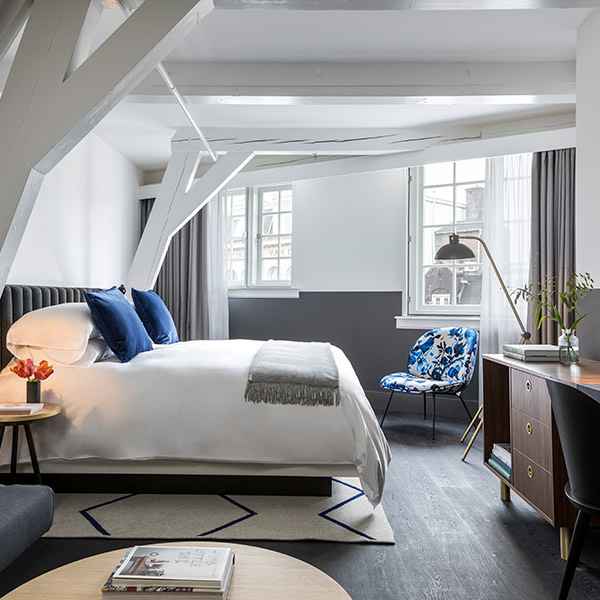 Opening in Amsterdam, gives us the perfect opportunity to indulge in the playful, creative and innovative approach to luxury that the city inspires in Kimpton’s unique and special way. Kimpton Hotels & Restaurants was acquired by IHG in 2015. IHG announced the further expansion of the brand across Europe with its second Kimpton hotel set to open in Paris in 2020. There are currently over 60 Kimpton hotels and more than 70 Kimpton restaurants, bars and lounges in 33 cities across Europe and the Americas. This is IHG’s 20th hotel in The Netherlands and is an exciting addition to the 675 IHG hotels across Europe.